So I just got home from work, and fired up my browser to check out the latest news from this year’s Microsoft PDC, by live streaming, and following the live blogging session. And as always, something big is underway. 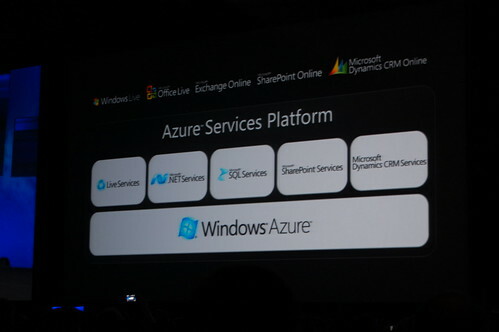 Windows Azure, is Microsoft’s answer to Amazon EC2. It is a cloud computing platform on Microsoft technology. I’m truly thrilled by the thought. This gives me great possibilities. As an entrepreneur, I get loads of ideas. My biggest pain is always how to deploy this. Funding is a big issue, and this leads to compromises in server infrastructure and stuff. As a developer, I’m not that much focused on servers and thing alike, so to have a big platform is an advantage. At PDC2008, they showcased a mobile app called Bluehoo. On stage, by editing an XML file online he scaled his platform from 1 to 20 nodes to be capable of the upcoming load due to the the announcement made at PDC. On the Windows Azure site, the links to SDK’s and VS2008 tools are broken. They should be good shortly! **Update: **For more information on Windows Azure, check out this blog post at Channel 10.